GRILL DIRECTIONS: Heat grill. Place spinach in large bowl. In small saucepan, combine orange juice, brown sugar, vinegar, orange peel, salt and shallots; mix well. Bring to a boil over medium heat, stirring occasionally. Immediately pour over spinach; toss to combine. Divide evenly onto 4 individual dinner plates. When ready to grill, lightly sprinkle 1 side of each chicken breast half with 1/8 teaspoon of the pepper blend. Place chicken, peppered side down, on gas grill over medium heat or on charcoal grill 4 to 6 inches from medium coals. Cook 5 minutes. Lightly sprinkle chicken with remaining pepper blend; turn chicken. Cook an additional 3 to 5 minutes or until chicken is fork-tender and juices run clear. Slice chicken breasts crosswise into slices; do not separate slices. Fan chicken slices; arrange 1 breast half on spinach mixture on each plate. 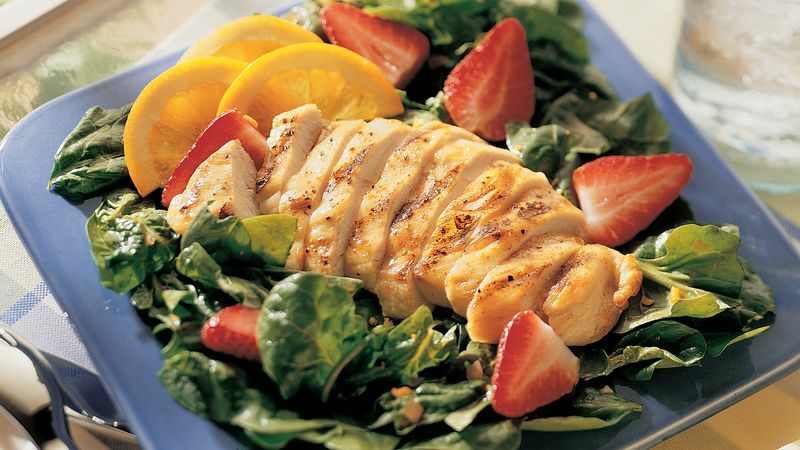 Arrange halved orange slices and strawberries around chicken.